Polymeric Sand Market Size was valued over USD 50 million in 2018 and the industry will grow by a CAGR more than 7.5% up to 2025. Increasing investments in public infrastructure development along with rising demand of luxury homes across the globe are the factors driving the growth of polymeric sand market. Polymeric sand is broadly used for filling gaps between various types of pavers such as concrete, stone and rock pavers. According to American Society of Civil Engineers (ASCE) the U.S. interstates are facing problems of traffic delays and congestion, costing around USD 170 billion in wasted fuel and time. The Trump administration has proposed an infrastructure plan in order to invest more in improving old as well as developing new economic infrastructures such as roads, airports, railways, etc. This will subsequently boost the demand of polymeric sand as it is mainly used in pavements and auxiliary spaces along roads, airports and other mass transit infrastructures. Developing economies will show an extraordinary growth in infrastructure spending due to increasing urbanization over next decade; Brazil is one of the leading developing countries in Latin America and the current investment in infrastructure sector of Brazil is USD 1.5 trillion while the need of investment is around USD 2.7 trillion, this gap in investment makes it a potential infrastructure market in coming years. 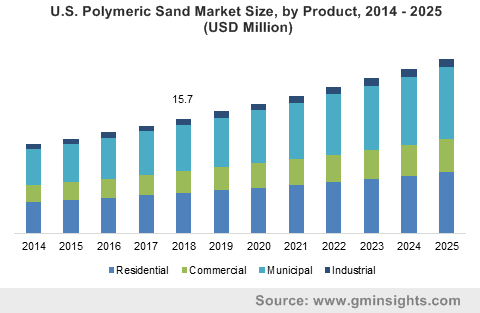 Similar trends can be observed in other developing countries such as Mexico, China, Southeast Asia and India, which will drive the growth infrastructure sector, thus in turn giving an up thrust to demand of polymeric sand market over forecast timeframe. Ability of product to resist insect infestation, deter weed growth, and enduring protection against harsh weather conditions will further contribute towards the product market growth. Besides, these polymeric sands have certain disadvantages such as formation of polyhaze that settles on the paving stones due to excess product remaining on them, thus deterring their appearance. This factor along with a low public awareness about the product in most of the emerging nations will hinder the product growth rate in near future. Based on product, the market is segmented into polymeric sand and polymeric dust. Polymeric sand holds the largest share in the market, which is attributed to its extensive usage in joining pavements for driveways, footpaths and other auxiliary spaces along roads. Majority of pavements laid for such applications have joints less than 2 inches, where polymeric sands are majorly used. With rising concerns of developed economies to improve their aging infrastructures the product demand is expected to increase, as it is durable and requires less maintenance. On the basis of application, the product market is segmented into patios, pool deck, pavement and auxiliary spaces, parking spaces and others. The others include use of product for concrete overlays, expansion or false joints, etc. 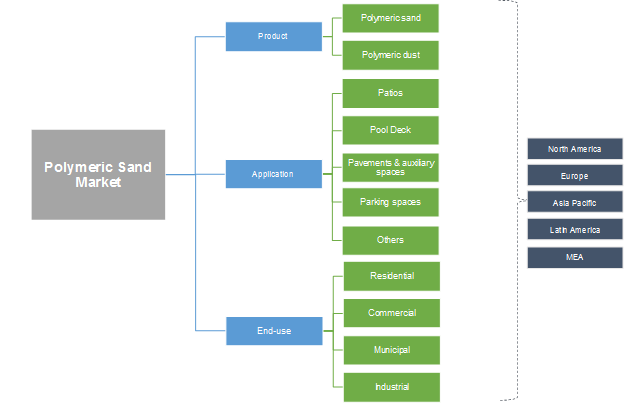 Among these, pavement and auxiliary spaces hold a substantial share of around 50%; and with initiatives taken by various nations across the globe to improve the roads and other transportation network, the product demand will escalate as polymer sands are extensively used in the footpaths, sidewalks, cycling tracks and sometimes even for roads. Globally polymeric sand finds application in residential, commercial, municipal and industrial. The residential sector will witness a healthy CAGR of around 6% from 2019 to 2025. Burgeoning growth witnessed in housing industry along with investment done by homeowners in renovation works will increase the demand of polymeric sand. Increasing focus of homeowners towards decorating homes with gardens, patios, etc. due to rise in disposable income will further contribute in product market growth. For instance, in the U.S. 86% of the household owners have outdoor living spaces and a similar pattern is seen in many European countries such as UK, Poland, France, etc. Europe polymeric sand market was valued at more than USD 15 million in 2018 and will witness a decent growth over the forecast timeframe. Europe has a mature construction market but increasing concerns of governments to reduce investment gap and improve old infrastructure the demand of product will escalate. Also, in many European countries the gardening and landscaping industry is flourishing. This will drive the product demand as it is used for building walkways, covered patios and kitchens in gardens and backyards. In Asia Pacific and Latin America, the market is likely to escalate as people are now adopting luxury lifestyles due to rise in per capita income of the population. They demand for bungalows and row houses with swimming pools, lawns, patios, etc. is bolstering in such regions, making them a prospective market for polymeric sand in near future. Some of the key players in polymeric sand market are Fairmount Santrol, SRW Products, Techniseal, Ash Grove Packaging, SEK Surebond Inc., Sakrete Inc., Alliance Designer Products Inc., TCC Materials, Silpro, Sale Marco, Promasonry, etc. The overall competitive landscape is fragmented with the presence of several regional and local players around the world. Polymeric sand market is driven by increasing demand of premium homes with outdoor spaces all across the globe. It is also expected that rise in investment for developing better transit infrastructures will also contribute towards product market growth rate. Also, many key players are capitalizing opportunities by offering their product through e-commerce. This gives them the ability to increase their product reach in regions which are not yet penetrated giving an up thrust to the product demand.